Our focus is designing your dream kitchen combining the very best in functionality, style and versatility. With our award winning design team by your side we can walk you through the process from initial concepts to final completion of the ultimate space. Working from plans or starting from scratch our experienced team will guide you through the design process and product selection options, then our qualified and dedicated joiners will manufacture and install your new kitchen. Having worked in architectural design for 15 years, Mark Brown started Solutions Architecture in 2000, which comprises of an experienced team, most who have over 20 years experience in the industry. We pride ourselves on honestly and integrity in terms of delivering a project at realistic prices. We love working with clients that have open minds and let us create a unique and special project for them. At Solutions, we all have a vested interest in seeing our projects to completion and helping our clients achieve their dreams. Our clients say they like our frankness and reality in terms of what will suit their site and budget, we carefully take them through a process of design and obtain cost estimates at appropriate stages to save any wasted time. Our documentation for consent purposes is of a high standard leaving no reason for doubt . Solutions also follow through with site observation and contract administration services giving the client more confidence that we are there supporting them right through the build process as well (a common comment from clients is “I’m so glad we had you on board for the build, there was so much we didn’t realise or understand, you supported us and made the project as smooth as possible, we would do it again but only if you were there for the build”) We work primarily in Auckland but have completed projects in the far north as well as in the south island. Solutions do not prescribe to a particular vernacular of architecture but prefer to fit the architecture to the clients brief and the site, having completed ultra-modern homes, villa replicas and alteration projects as well as specialist commercial projects from Integrated Medical Centres to Aged Care and Dementia Care facilities, Beach houses to Multi-Unit developments. CLIENT LED THINKING Kitchen Element's vision is to redefine kitchen and living spaces for their customers. It is important that our clients have the opportunity to participate in the design process, so they are assured a quality product and outstanding service to meet their budgets from start to finish. We have created a solution from concept to installation. With superb designers who listen and care, detailing every aspect of the cabinetry and materials to suit your home. OVER 10 YEARS OF EXPERIENCE, CREATING SOME OF THE INDUSTRY TRENDS AND INNOVATIONS, WE HAVE SET A PATH THAT OTHERS FOLLOW. OUR PASSION IS CREATING BEAUTIFUL, FUNCTIONAL AND TIMELESS KITCHENS THAT ENHANCE YOUR LIFESTYLE. WHATEVER YOUR SPACE, YOUR PERSONALITY OR BUDGET WE HAVE A SOLUTION FOR YOU. WE WORK CLOSELY WITH OUR CLIENTS FROM CONCEPT, MANUFACTURE TO INSTALLATION TO ENSURE EVERY DETAIL IS CONSIDERED. SEE OUR PORTFOLIO FOR EXAMPLES OF PAST PROJECTS. Davista Architecture Ltd is a company which was formed by its principal, Colin Davis, who’s been self-employed in the architectural design industry for over 30 years, and joined with fellow director Kane de Raat in 2010. Davista are architectural designers and the national professional body that represents architectural designers is called Architectural Designers, or ADNZ (INC). Colin Davis, the managing director of the company and kane de Raat director are both full professional members of ADNZ (INC). Boutique Architectural design company that can tackle any project from 3.5k to 3.25m. I create stunning art using upcycled twelve inch vinyl records. And I give you the choice of labels for really personal gifts for friends or something just for you. 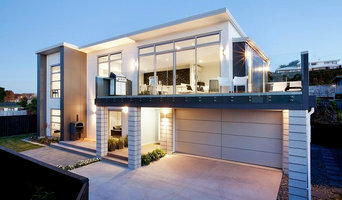 Geoff Brown - Architectural Designer. Effective Green Building begins with design. At Mercury Bay Design we are reimagining the building process through new technologies and a better understanding of building design to produce homes that have less impact, cost less to run and are more enjoyable to live in. Better homes by design. Kitchen Zone is owned and managed by Tony and Lynda Sharp. With 35 years experience in the industry, 20 of those designing and building kitchens, Tony made the decision to step out and start his own Kitchen and Joinery Manufacturing business. 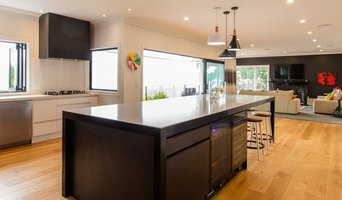 Operating since 2005 Kitchen Zone has produced a vast range of Kitchen/joinery/cabinetry solutions from a contemporary minimal style to traditional French provincial look. Our design process starts with the end user in mind and we work to meet client specifications as well as offering alternate solutions that may not have even crossed your mind. Quality and customer satisfaction are of the highest importance to Kitchen Zone, that is why Hettich Hardware is used for all cabinetry requirements as it comes with a life time guarantee and provides superior functionality “making living spaces work beautifully”. From Wairoa to Waihau Bay and everywhere in between, we can get your project sorted and installed with no hidden costs. Pacific Stone was established in 1985 and we are now a leading supplier of natural and engineered stone kitchen and vanity bench tops. We cater for the domestic and commercial market throughout the North Island. 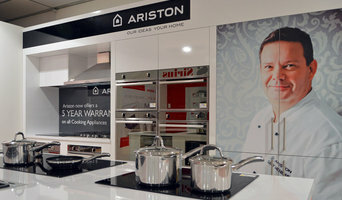 We supply to most kitchen/cabinet makers from Auckland to Palmerston North. A distribution partner like no other. Search Houzz's ratings and reviews to see who fits the bill for your job. Appliances repairs may seem like a quick job but be prepared - you may have to wait for new parts. And with some appliances, such as ranges, grills and other pieces powered by gas, hiring a pro is a smart safety precaution. Your appliance professional might handle any or all of the following jobs: selling, installing, repairing and upgrading both small and large appliances. He or she can advise you on the right equipment for your home, from features to finishes, and is usually in the know about the latest technological advances and bells and whistles. When appliances hit a snag or start to show their age, a pro can advise you whether to repair or replace them, then carry out his or her recommendation. Some appliance professionals work closely with builders, renovation contractors, and kitchen and bath designers, among others. Here are some related professionals and vendors to complement the work of appliances: Kitchen & Bathroom Fixtures, Kitchen & Bathroom Designers, Kitchen & Bath Renovators, Specialty Contractors, Building Project Managers. Find an appliance professional on Houzz. Narrow your search in the Professionals section of the website to appliances. You can also look through photos to find examples of rooms with appliances you like, then contact the professional who worked on them.